During the season of Easter the scripture lessons that are appointed to be read in worship for the 2nd reading – the Epistle – will all come from the book of Revelation. This gives us an opportunity to focus on this biblical book for the six weeks of the season of Easter. And while in the space of seven weeks we cannot possibly cover the entire book we can still experience some of its most important and beautiful sections and begin to get inside this most confusing book of the bible. The lessons themselves are listed below and will be the basis for a sermon series on those texts. In preparation for these readings and the sermon series, I want to use this space to provide some basic information about the book of Revelation. Probably there is no other book in the bible that is as misunderstood, but yet which has captured the public imagination as much as this book. The prevailing interpretation of the Book of Revelation is that it contains predictions of a time-table to the last days, and that all you have to do is decipher the code and you will know what and when the final horrific events will occur. Not only that, but this popular interpretation also reads the Book of Revelation as a book of fear and terror. Look, for example, at the immensely popular series of books called “Left Behind.” These books, based on Revelation and a few other spots here and there in the bible, interpret the “Day of the Lord” to be a horrible and fearsome day, filled with violence; a day which will be heralded in by a “Rapture” which will remove all of the “true” believers leaving the rest of the people to experience the full wrath of God. (By the way, there is no “rapture” in the Bible, it was invented in the 19th century). So the first thing that needs to be re-stated here at the very beginning of any study of the Book of Revelation is to be reminded that the Gospel of Jesus Christ is Good News, about a creator God who loves this creation so much that God sends the Son to reach out in extravagant and unexpected love and grace to the people. The Gospel is about love – not hate; the Gospel is about grace and forgiveness – not judgment; the Gospel is about freedom and peace (shalom) not fear and terror. How can it be that we would allow one very cryptic book of the bible to have more authority than the Gospels to the point that we would throw out all of Jesus’ teachings about God’s love and grace in favor or hate, violence, judgment and fear? Remember, Martin Luther’s instruction to Christians about how to read the bible – always read the Bible through the lens of the Gospel. When in doubt The Gospels always should not only color our interpretations but should determine how we even approach these books. So, some basic facts: The book was written around the year 95 AD during the reign of the Roman Emperor Domitian. Domitian had revived the cult of Emperor worship and was demanding that everyone in the empire submit to this as a sign of their loyalty to Rome. In earlier times Christians had been given a pass on these laws because initially Christianity was seen as a sub group of Judaism, and Jews were exempt. But by the year 95, Christianity had broken from Judaism, therefore Christians were expected to submit to all the same laws and participate in all the same rituals as everyone else. Principal among these was that people were expected to offer incense at the altar of the emperor and confess that Domitian was “our Lord and God.” Christians, of course, refused and were thus subject to arrest, trial and execution. Now Domitian did not go looking for Christians in order to single them out (in fact a letter exists in which he gives very direct orders not to search out Christians or to allow anonymous accusations), but when individual Christians made a public stand of refusal they were to be executed. The result is that probably hundreds (maybe 1000’s – it is hard to know how many) of Christians were executed, some in very violent and gruesome ways. The author is John of Patmos. John was apparently a leader or pastor in the church who had been exiled to the island of Patmos, which was little more than a large stone in the middle of the Mediterranean Sea. This is NOT the Apostle John, the beloved disciple from the Gospel of John. In fact, John of Patmos has absolutely no connection with the disciple John or with the Johnnine community whatsoever. The book we know as the “Revelation of John” is a pastoral letter intended to bring comfort to those who are experiencing the pressure of persecution under Domitian and who had seen some of their leaders and loved ones executed. This is so important it is worth repeating – the book of Revelation is designed as a pastoral letter of comfort and assurance. The basic message is this: the forces of evil have run amok, but fear not for God is with us and will never abandon us. And, by the way, those who are perpetuating terror and violence will receive just punishment in the end. The letter is written in Greek and is titled, in Greek, “The Apocalypse of John.” The word “apocalypse” refers to the literary genre or type of letter, and stands in a long, long tradition of apocalyptic writings that go back to the book of Daniel in the Old Testament that includes a huge number of works that were written during the time of the Maccabean Revolt. The “Apocalypse of John,” or “Book of Revelation,” (no “s” – Revelation) is not by any means the only example of Christian apocalyptic writing, but it is the only such work that ended up included in the New Testament canon (and it almost didn’t make it as many churches and leaders opposed its inclusion.) 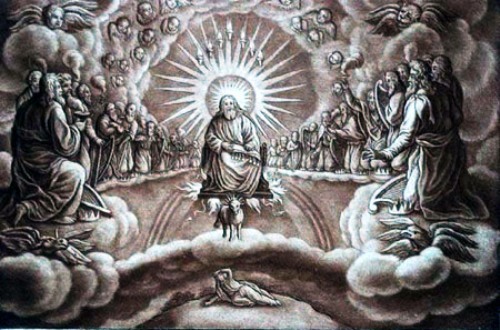 Another work of Christian apocalypse, “The Shepherd of Hermas” is another work which lays out a series of visions that almost made it into the New Testament but was excluded (thankfully) at the last minute. The letter of the Apocalypse of John is a series of visions. These visions are not to be taken literally, and they would not have been by the original readers of this letter. John uses symbolism in order to create a series of pictures that were intended to provide comfort. For example, the “beast” with seven humps refers to Rome, which is built on seven hills. Additionally, there is an abundance of Old Testament references. In fact, out of a total of 404 verses in the book, 278 of them contain one or more allusions to the Old Testament. Another example is the number 7 – which was symbolic of perfection. As we read through this book notice how many times the number seven appears. John’s visions should be understood in the same way we understand other visions that are recorded in the Bible. Think of Ezekiel and the dry bones or the wheel “way up in the middle of the air;” or think of the important vision of Peter’s that is recorded in Acts 10 and led to an new understanding of the place of the law (especially the dietary laws) in the new Christian church. These are all symbolic visions, and like the entire Book of Revelation, they need to be interpreted carefully in order to understand them. The Apocalypse of John, or the Book of Revelation is a part of the Bible and therefore it has much to say to us. But we must set aside all the popular sensationalist interpretations and look at the book within the context of its times and culture. We must take the symbolic visions and work to understand what they are trying to say to us instead of us imposing our own fears and prejudices upon the text. We must move away from seeing this book as a set of predictions of the time- table of the end times and see it as a pastoral book of comfort written to believers during difficult and hard times. When we do this we can unlock the secrets of this book and bask in the beautiful images that make up John’s vision. Ultimately what we hear over and over again in this book is nothing less than a repetition of the promise that no matter what God will be with us and that God’s love is steadfast and sure.